I know, I know. “Oh how the other half live” and all that. Honestly, I cannot believe how I ended going on 4 holidays/minibreaks in two months. I really need to space these out more. Seriously, my passport has been water damaged since the first day in New York and I need to get that dealt with. 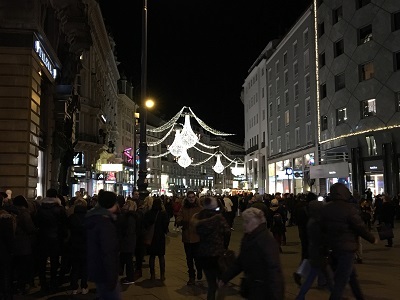 Vienna is one of those places that, for whatever reason, never majorly featured too highly in my holiday consciousness. I knew it was beautiful and know people who have been there and really loved it, but as I was walking around the city centre I felt this weird disconnect. It was something along the lines of “I’m in Vienna? This is Vienna? 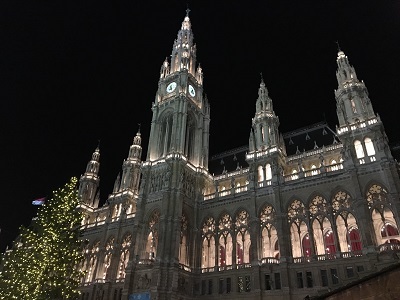 How have I lucked out and ended up in Vienna?” Maybe I just went through a bit of disassociation due to having to get up at 04:55 this morning. The first day in a new place has the tendency to be odd. You need time to get used to a place in terms of geography and culture. Having gotten to our hotel little after midday we still had most of the day to explore the local area. You don’t have to walk too far in Vienna’s centre to come to the conclusion that the architecture in this city Is deliciously overblown. Buildings aren’t only grand, but they are domineering with their flourishes, statutes and cornices. This is by no means a criticism. 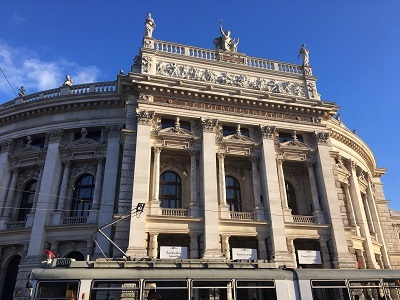 It’s just that in London you’ll get a small area with interesting architecture and then it’s pretty pedestrian, whereas in the Vienna city centre it’s pretty much all singing all dancing wherever you end up. I mean just look at their parliament building. There is nothing about this building that doesn’t feel grand about this place. Makes sense that it was originally built as a seat of power for the empire of Austria-Hungary. We spent most of the afternoon wandering the streets, looking at buildings and trying to find some form of lunch. Vienna is famous for its cafe culture and, honestly, we were looking in all the wrong places as we found nothing for a very long time. 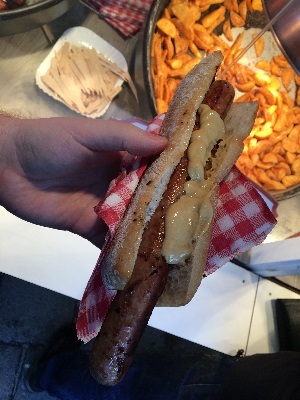 Having given up hope on finding a place to have a sit down meal (where the queue didn’t stretch out of the door) so we opted for the classic bratwurst in a roll. You can never go wrong with that. Of course this is when we started to spot cafes. So, we dragged our tired feet into the Mozart Cafe (side note: everything here is Mozart themed – it’s actually quite weird) and it allowed me to grab the first, of what may be a small number of, food item. Aside from schnitzel there are few things more Viennese than a Sachertorte. 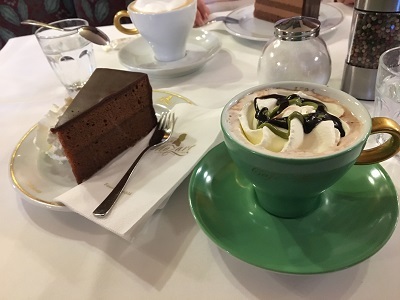 It was invented in the Hotel Sacher around the corner from this cafe (would have gone in, but lines) and is pretty much the city dessert. Think of it as a dense chocolate cake with apricot jam spread around the sides and in the middle. It is then finished off with dark chocolate icing and a quiet of whipped cream. Think this cake sounds rich? Then you would be right. Pretty damned moist as well, which is also helped by the side of cream. The cup next to it was a hot chocolate with pistachio syrup. I guess chocolate cake was to satisfy that craving. 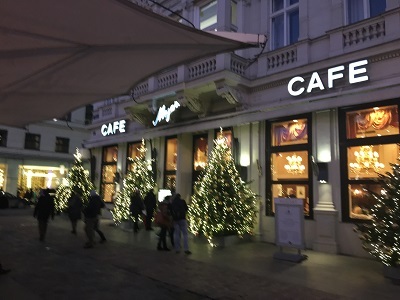 By the time we left the cafe the sun had gone down and we were able to enjoy Vienna for the reason we actually came here – Christmas lights. Not just one uniform set of lights either; it would appear that each street do their own lights since there was no real repetition that we saw. 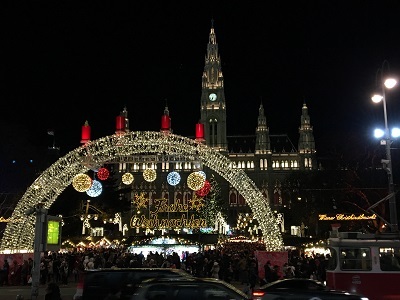 Not only are there so many lights, but also there are so many Christmas markets dotted all around Vienna. I think we came across six different ones today and I am sure there are more left to be discovered. We meandered around and ended up at the biggest of all the Christmas markets: outside the town hall (and coincidentally a 3-4 minute walk from out hotel). There are over 100 stalls here selling food, souvenirs and all things Christmas. I know that during our time in Vienna we will be back here every night for a roam, a browse and a snack. For dinner myself and the hub opted for soup in a loaf of bread. 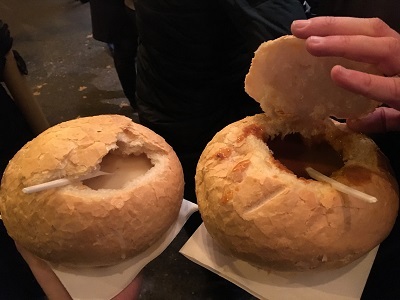 Honestly, we just stood there eating soup out of the hollowed out loaf before then eating the bowl itself. There was just something so satisfying about ripping apart that bread bowl that had become saturated with garlic soup. After an early start this morning it is an early night tonight so we feel human as we tackle the one Lonely Planet area of Vienna.